I've been pretty good all month. Been early to my new job every day. Paid all the bills and kept the cat litter and an acceptable level of cleanliness. I watched the Olympics and cheered for the underdogs. So with all that good karma stacked in my favor, I think it may be time to reward myself for not being a complete sociopath. I love the Pocket Invisiboys from Super7. I don't know what it is, but every time they release a new version I get really excited to add it to my growing hoard. This guy will be available today starting at noon Pacific time for $25. 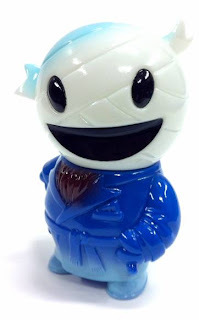 Get him by going to http://super7store.com/. 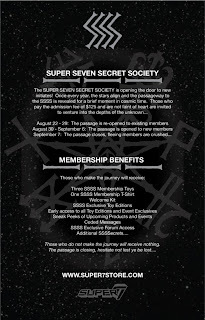 Super7 is also opening up membership slots in its Secret Society club thingy. All the details are in the picture right there, so I'll let you click on it and read them to save me from being redundant. Basically it's kinda like Fight Club except you get toys instead of punches to the face. It's better to have an existential crisis in this fashion rather than developing a split personality and making soap out of human fat you pillage from medical waste bins. Maqet x Emily the Strange Coming Soon? Doktor A x Kidrobot 8 Inch Dunnys!!!!!!!!!! Custom Toy of the Week: Trenton M.